Sooke salmon fishing seems to be transitioning from Coho to Winter Springs. A few reports of coho out in the tidelines, fishing deep (90-12o feet), a mixed bag of wild and hatchery, though on the smaller side, around 7 pounds. 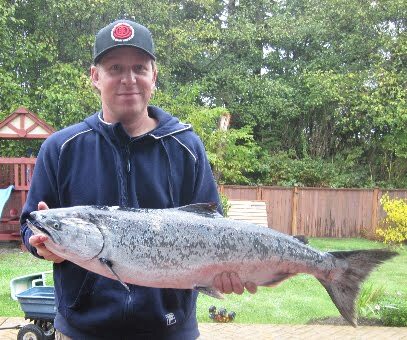 There's more reports now of anglers targeting feeder Chinook salmon ... or "blackmouths" for the Americans. This is an fun and productive fish to chase, right in front of Sooke from the Bluffs to the Otter Point Trailer Park. They are often smaller, 5-8 pounds, but you sometimes can find a nice bigger one in the teens. Generally you fish in depths of 100-140 feet, with your gear 10 feet above the bottom, and troll with purple haze or glow hootchies, with any flasher. There is often consistent action, throwing back smaller ones until you get some keepers. When the action gets really steady, you can try running lighter gear, with spoons or bait and no flasher -- get more of a fight from these scrappy little salmon. Jamie sent in a couple of photos of a fun Sunday morning trip -- left at 8am, back by 11. He was in front of Sooke in 120 feet of water, fishing at 100 feet with a silver Betsy flasher and irish mist (green white) hootchie. 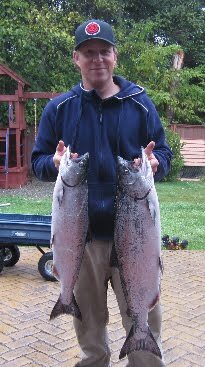 He kept two salmon, 16lbs and about 7lbs, plus released 4 smaller ones. Home in time for brunch with the missus and lots of time for the "honey do" list, with dinner now taken care of -- a pretty good way to spend a Sunday morning!